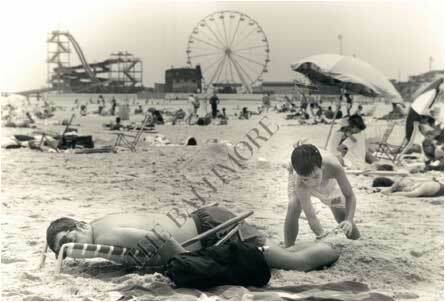 Morbid Manor ad as seen on the side of the pier building in 1976. Special thanks to Gerald U. 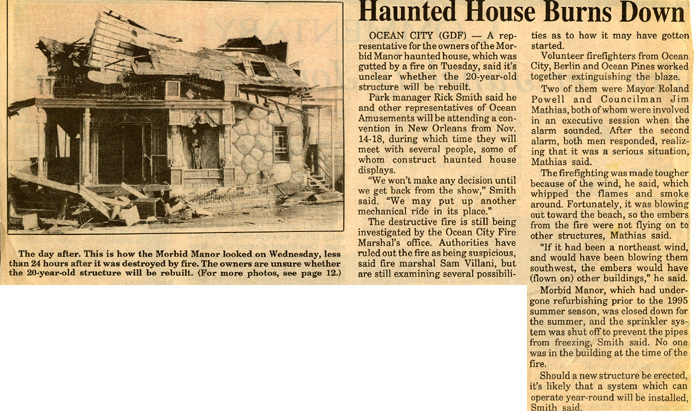 When visitors of Ocean City’s famous boardwalk think of memorable icons from the past, the Morbid Manor undoubtedly comes to mind. 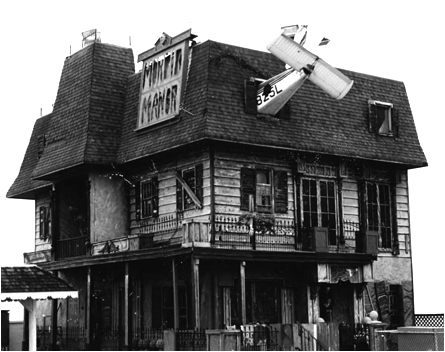 Debuting in 1975 for its first season, The “Manor” was a two-and-a-half story walk thru attraction that was known for its live actors, demonizing appearance, and sinister props and effects. Although not a Trimper attraction, it was a one-of-a-kind attraction that stood out from its competitors thanks to its realistic façade and exterior gardens. 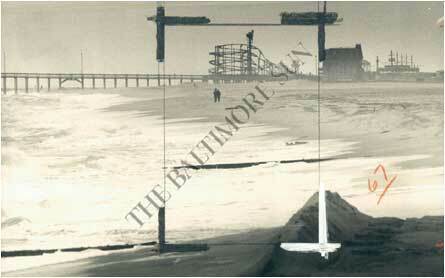 It towered over the pier and could be recognized from virtually any distance on the boardwalk. 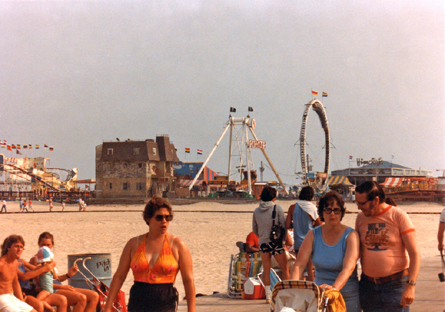 It was not simply another carnival attraction, but instead it looked as if an actual abandoned house was uprooted and placed on the pier. 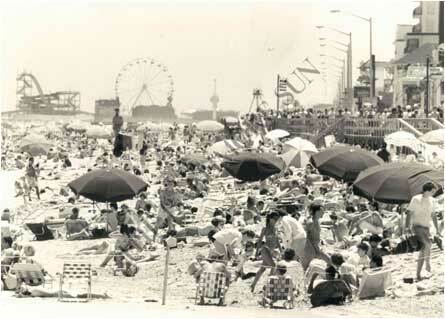 It was a rather supernatural experience and scared hundreds of thousands of brave patrons during its tenure on the boardwalk. 1977 - Special thanks to Gerald U. 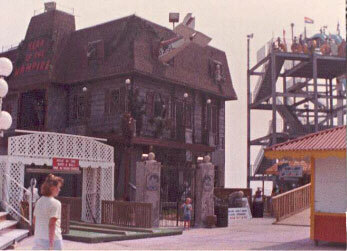 Mid 1980s - "Year of the Vampire" can be seen on the facade. 1983. Special thanks to Gerald U. 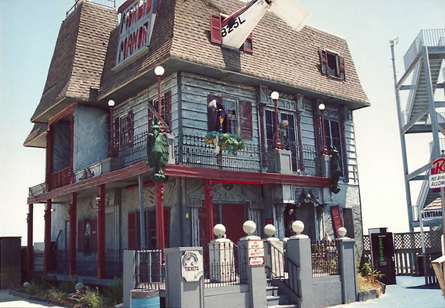 The Manor was designed and constructed by legendary dark ride designer Fred Mahana who is known for his legendary work in Wildwood, NJ on such attractions as Hitchcock Manor, Dracula’s Castle and Theater of Blood. Mahana had a knack for making any concept a reality, despite how far-fetched it may have seemed. 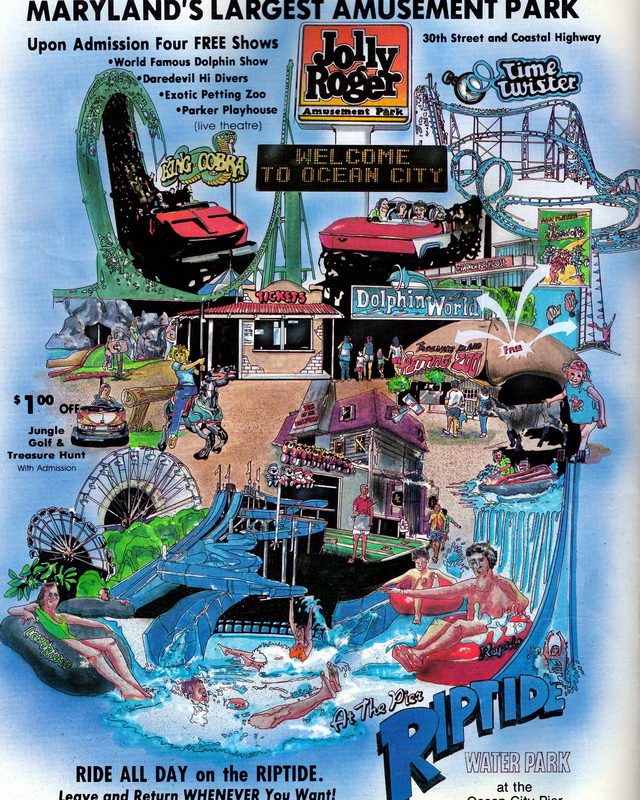 A the start of the attraction's lifespan, the pier was under the ownership and management of Ocean Amusements Inc.
A full-page ad for Jolly Roger Amusement Park from the summer 1987 issue of Ocean City Resort Guide that includes an illustration of Morbid Manor which has a title of "Vampire of the Year." 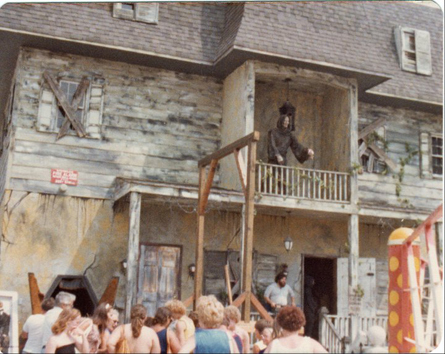 One of the scariest elements to the attraction was the talented live actors that strategically hid in the Manor and chased customers with chainsaws. At times, the actors were theater majors from colleges and universities that came to work at the attraction for the summer. Their makeup and costumes altered their appearance just enough to leave even the bravest visitor screaming in horror. Unknown to many, the Manor was a hip place off-hours. 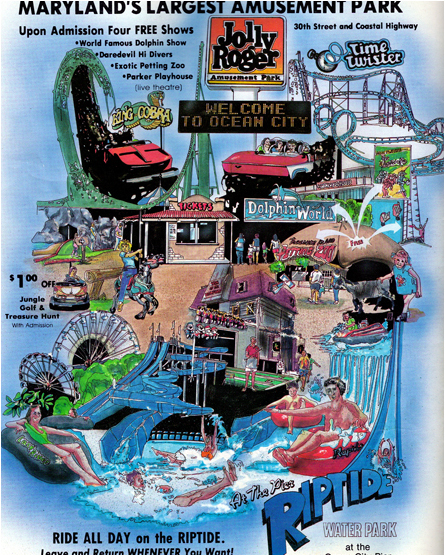 The management and workers of the ride would often hold band practices behind closed doors and sleep there throughout the nights despite a lack of air conditioning and uncomfortable 100 degree beach temperatures. To those who ran the attraction, it was more than a job; it was life. And, a lot of past employees of the attraction still display and share their pride proudly for the attraction that was basically a second home for many years. Several past employees have started a Facebook page and share photos often of their wild times working in the Manor. 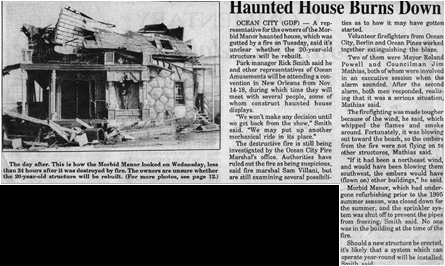 In early November of 1995, a real-life horror show transpired on the pier as Morbid Manor burned to the ground. 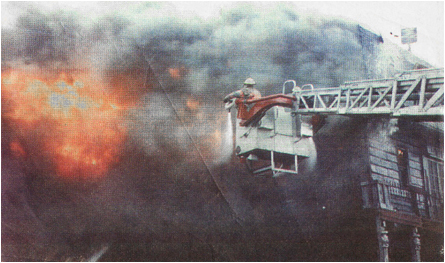 Fire crews from all over fought the fire but were unable to salvage the famous attraction. 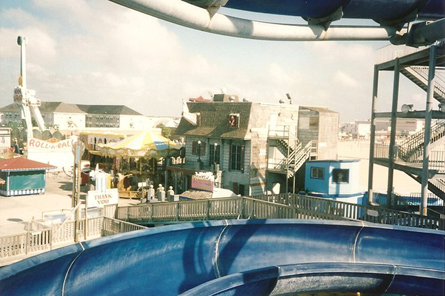 Ironically, the ride had just undergone a large renovation the year before and both the interior and exterior were completely revamped. 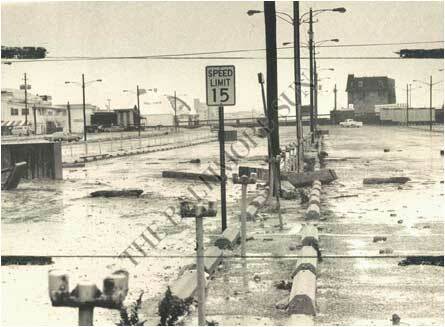 Although the building had a complete sprinkler system, it was shut down for the winter to prevent the pipes from freezing. 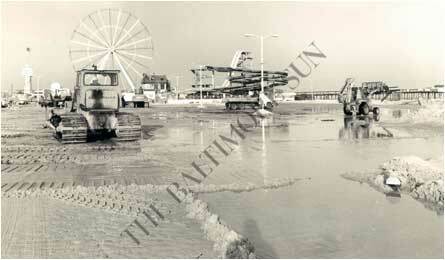 Photo pulled from an article published in Ocean City Today - November 10, 1995. 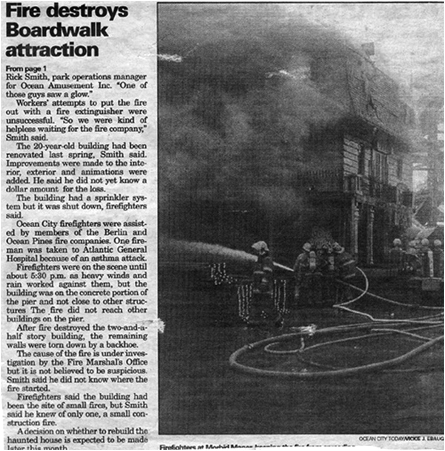 Article published in Ocean City Today - November 10, 1995. 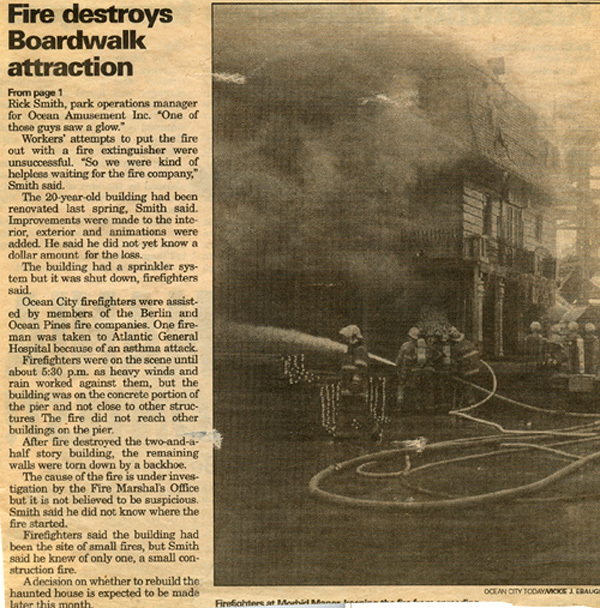 Article published in Ocean City Dispatch - November 10, 1995. 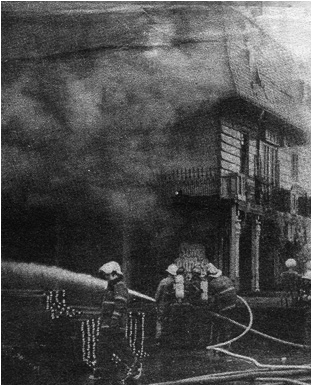 Shortly after the devastating fire, rumors began to circulate regarding the cause of the fire. Some believe it was an electrical fire. Others believe the fire was caused by sparks due to the grinding and cutting of steel for the removal of a nearby waterslide during the same time period. 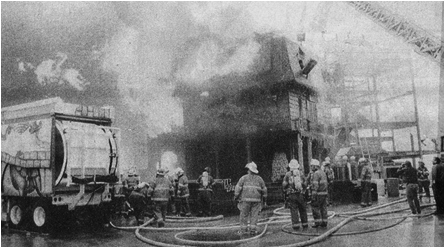 Firefighters completed an investigation, and they concluded that the fire did not seem suspicious, although a final cause was never publicized. 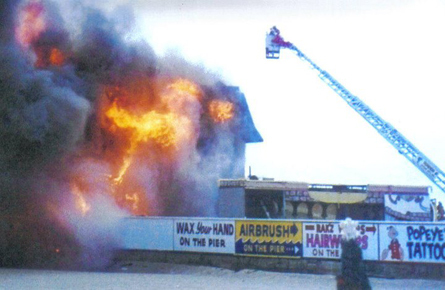 After the Manor was destroyed by fire, an effort was made to keep the dark ride tradition alive on the pier by adding a portable dark ride called “Ghost” in the late 1990s. 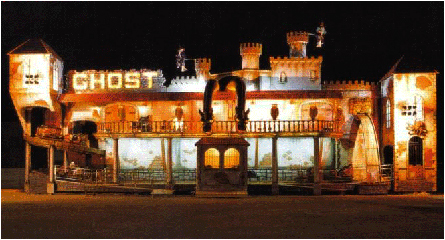 “Ghost” was a Barbisan dark ride from Italy that included several animated stunts and a façade that resembled a castle. After several years of being in operation, “Ghost” was renamed “Ghost Pirates” and artists added pirate imagery to the façade before it was completely removed in 2006. 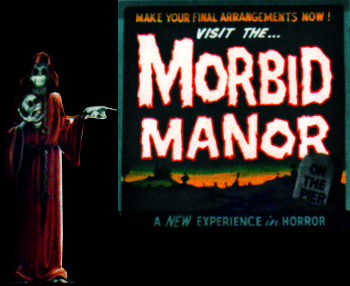 The next season, a Zachinni portable dark ride was added, this time called “Morbid Manor II”. The ride featured mostly metal sculptures for effects, and included very few animatronics. 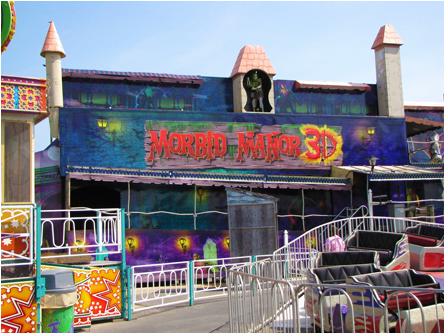 In 2010, the ride was overhauled with a 3-D façade, new props were added, and the ride was retitled “Morbid Manor 3-D” in an effort to attract a broader audience. 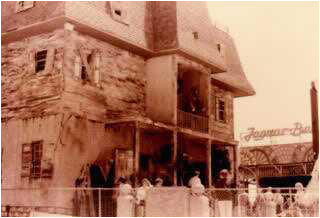 "Ghost" dark ride that took the place of the original Morbid Manor. Morbid Manor II as it looked around 2008. Morbid Manor 3-D as it looked after the makeover in 2010. 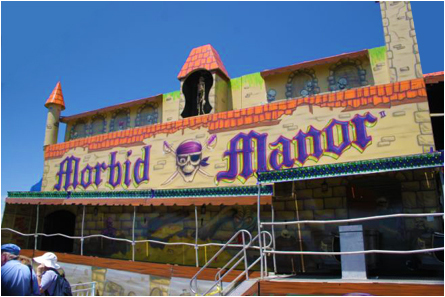 As of 2012, reviews of the portable Morbid Manor 3-D ride have been mixed, but it’s obvious that the original Morbid Manor is deeply missed by all who remember it.